MinRMS is a program for finding minimal root-mean-squared-distance (RMSD) alignments between two proteins as a function of the number of matching residue pairs within a heuristically limited search space. The alignment algorithm uses coordinates of alpha-carbon atoms to represent each amino acid residue and requires a total computation time of O(m^3 n^2), where m and n denote the lengths of the protein sequences. For practical purposes, the search is exhaustive. The method is fast enough for comparisons of moderate-size proteins (fewer than ~800 residues) on current workstation-class computers, and therefore addresses the need for a systematic analysis of multiple plausible shape similarities between two proteins using a widely accepted comparison metric. MinRMS generates a family of alignments as a function of the number of matched residue pairs. That is, for two proteins of sequence length n and m (n >= m), there will be m best RMSD alignments. We have developed a visualization tool, AlignPlot, to facilitate exploration of this potentially large number of alignments. Such a graphical user interface provides a facile way to explore the alignment space, and addresses concerns raised by others who have suggested it may not always be easy or even possible to find a single "best" structural alignment. The figure below shows the results of structural comparisons of glutamine synthetase (GS) and creatine kinase (CK) done with minRMS. Although GS and CK have no significant sequence similarity, both enzymes have multimeric forms, proposed similar tertiary structure, and catalyze similar reactions involving ATP. 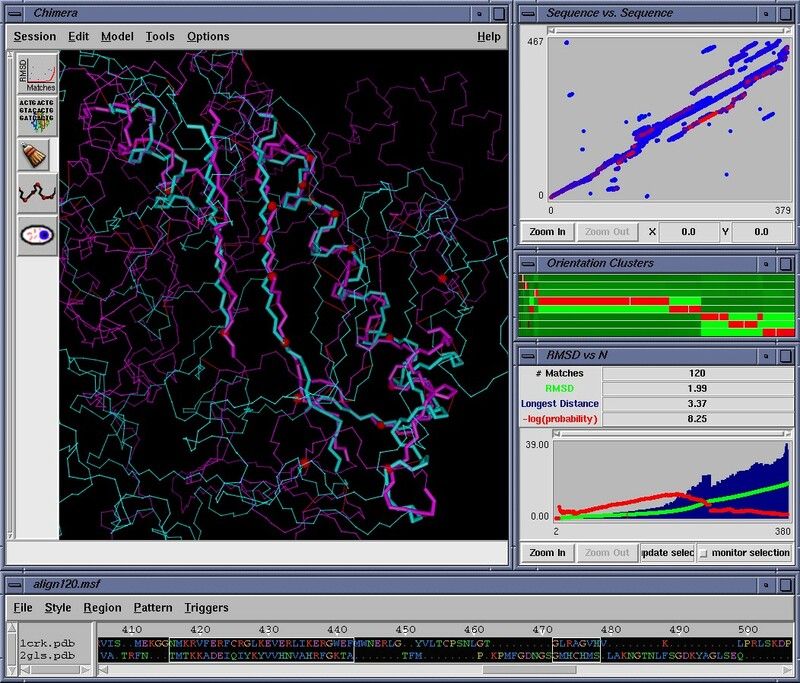 Shown the figure below is the user interface for AlignPlot and the related programs MSFviewer, Cluster, and Chimera. A.I. Jewett, C.C. Huang, and T.E. Ferrin, "MINRMS: An Efficient Algorithm for Determining Protein Structure Similarity Using Root-Mean-Squared-Distance", Bioinformatics, 19(5):625-634 (2003). C.C. Huang, W.R. Novak, P.C. Babbitt, A.I. Jewett, T.E. Ferrin, and T.E. Klein, "Integrated Tools for Structural and Sequence Alignment and Analysis", Pacific Symposium on Biocomputing, 5:227 (2000). MinRMS is available in source code form (download now). A development environment (i.e., a C++ compiler) is necessary to generate an executable version of the program after download. Currently, the code will not compile on Windows.